It has been warned that drinking fake alcohol can put you in a coma. THE SALE OF counterfeit alcohol has been linked to a number of suspicious deaths as Revenue warned of a crackdown on the illicit trade before Christmas. A number of rogue dealers have been caught in the past 12 months by Revenue and gardaí and they say this time of year is always the busiest for the traders. Pat Gralton is the Revenue enforcement manager in the Border Midlands West Region. He explained that all across Europe there are deaths related to the sale of fake alcohol. He said: “Alcohol is a high-risk product. If you look up the Czech Republic or Turkey for counterfeit alcohol deaths, you will see there have been scores of people who have passed away. Illegal alcohol has been detected by Revenue across the country. Officers check licenced premises and use scientific analysis to ensure their stock is the real deal. However, Gralton described how intricate the counterfeiting process is. He added: “The counterfeiting process is so good, the bottles, the labels, the corkings are very good. It’s almost impossible to detect unless you go in knowing what you’re looking for. It’s the unscrupulous trader who purchases his stock from a white van at night who is the problem. 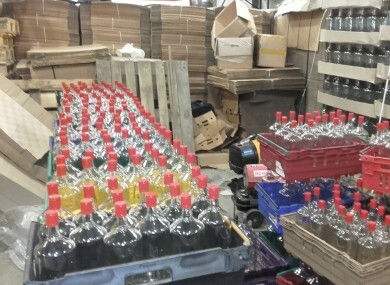 Last year, Revenue raided a premises close to the border in Louth and discovered seven people there applying counterfeit labels to bottles of vodka which were ready for filling. There were 4,500 bottles still there at the time of the raid but a large amount had gone through on their way to market traders and certain off-licences. A still being used to manufacture the dangerous alcohol. Alcohol safety activists have warned of the dangers of using the illegal drinks. Drinkaware’s chief medical advisor professor Paul Wallace explained: “Commonly used substitutes for ethanol include chemicals used in cleaning fluids, nail polish remover and automobile screen wash, as well as methanol and isopropanol which are used in antifreeze and some fuels. “These other types of alcohol can produce similar effects to ethanol in terms of making you feel tipsy. But they are also potentially very dangerous. Drinking alcohol containing these chemicals can cause nausea and vomiting, abdominal pain, drowsiness and dizziness. It can also lead to kidney or liver problems and even coma. Methanol, a substance which can be used in fake vodka, may cause permanent blindness. Email “Counterfeit alcohol has been linked to a number of suspicious deaths in Ireland”. Feedback on “Counterfeit alcohol has been linked to a number of suspicious deaths in Ireland”.